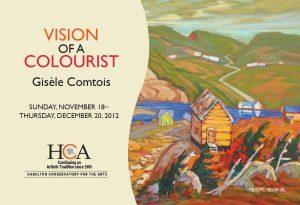 Gisèle Comtois was born in St. Marc-sur-Richelieu, Quebec, and now lives in Burlington, Ontario. The artist has taken countless sketching trips exploring the Gaspe coast, Charlevois County, the Laurentians, the Eastern Townships in Quebec, the Maritimes, Northern Ontario, Brazil, France, Italy, Germany, Holland and Spain. Among the long list of private, public and corporate collections that contain the artist’s work are: Monsanto Canada, Suncor Energy Inc, Merrill Lynch, Pfizer Global Pharmaceutical, BCE Emerges and 80 others.